No one becomes a cyclist because they love to do indoor trainer workouts, but riding outdoors is not always ideal and sometimes it's not even possible. 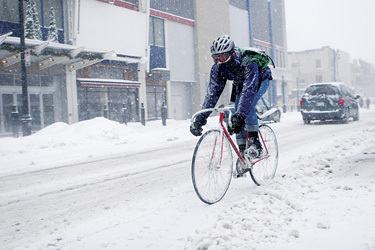 Cold, dark days and poor road conditions can make outdoor riding uncomfortable and unsafe for many people during winter months. Riding an indoor trainer can provide many unexpected benefits as well though, making it valuable even for those athletes that aren't forced indoors. 1. Control: There is an element of variability that one must expect when riding outdoors, even in the most controlled conditions. That can make it a big challenge to do certain workouts. For example, let's take one of the most popular interval workouts out there, 2x20s. Though there are many variations on this workout, the general idea is to do 2 x 20 minute intervals at a consistent power (usually level 3-4). If I were doing this workout, I would probably go to the first section of the Schuylkill River Trail and ride back and forth. The first section takes me about 7-8 minutes at my level 3-4, so I would have to turn around twice during each 20 minute interval. Now this isn't a big deal in the course of a 20 minute interval, but there are also a number of other factors such as pedestrians, other riders, changing wind conditions and uneven pavement that could make things difficult to hold a consistent power. Even if I succeed, I am probably putting myself somewhat at risk because I am constantly staring down at my computer. Those that are lucky enough to live in or close by mountains might do this workout uphill instead. The slower speed means that conditions change more slowly, giving more time to adjust (and thereby keep power constant). Still, if the grade gets too steep, muscle usage shifts and it may be impossible to keep a constant power at higher cadences (if that is the goal). Power file from an outdoor workout. Power file from the same workout, done indoors. Notice the difference? Before going any further, I should make it clear that constant power throughout an interval is not necessarily the goal of every workout. Since we race in highly variable conditions, we need to train in highly variable conditions. On the other hand, most workouts are not a race simulation. Each workout is designed to stimulate a certain system, and in many cases it is indeed beneficial to pinpoint a specific power range and stay as closely locked in as possible. This is easy to do indoors because the only things that can affect resistance are rear wheel speed and resistance setting on the trainer (if applicable). OK, well that's not completely true... as the tire and trainer warm up there may be a slight change in trainer resistance, and drive train resistance on the bike will also change a little based on cadence and speed. In large part though, these factors are minimal, making it much easier to lock into a desired power indoors. There is another factor here as well though. Most athletes are more likely to do technique drills and structured intervals indoors than outdoors and they are more likely to do them better. Because of the inherent boring nature of riding indoors, athletes are more likely to add structure and variety to their workouts. On 3 separate occasions I have had athletes I coach break their collar bones and have to ride indoors exclusively for 6-8 weeks. Each athlete came out of that period stronger than they started it because they were doing better quality, more focused and efficient workouts than they had been doing. Environmental conditions may also compromise the effectiveness of some outdoor workouts. If you are spending all your time trying to get warm (or stay cool for that matter), you probably aren't doing your intervals properly. 2. Safety: As we know all too well, there are many dangers of riding outside. Cars, pedestrians, potholes, animals and other cyclists are always potential dangers. In the winter months, snow, ice and road salt can be additional hazards and shorter days make it more likely that we find ourselves riding in the dark either at the beginning or end of a ride. Trying to do any kind of structured workout can add even more danger. I don't want to speak for everyone here, so I will just speak for myself in stating that if I am doing intervals outside I am more likely to run a red light, "buzz" a pedestrian or miss seeing something I should have seen because I am staring at my computer and trying my best to hold a specific power and cadence. Technique drills can be especially hazardous. I have known not one but two athletes (I won't mention any names) who have crashed while attempting one legged drills outdoors, one of whom ended up with a broken collar bone. 3. Instruction: While many may associate riding the indoor trainer with a dark, cold basement or garage, there are many options available these days for group indoor sessions, including some designed and taught by yours truly. People come for a variety of reasons: some because they don't want to shell out $1600 for a CompuTrainer at home, some for the social interaction, the accountability or the added motivation they get when working out with a group. From my perspective (as an instructor), what I like the most is that I can really see the athletes doing their workouts in real time. I can get a close up look at them, see if they are doing the workout properly, provide advice on technique, help them visualize and see clues that they might need new training zones or a bike fit. It's also a great time to talk about tactics and goals for the upcoming season. Not to mention, a few minutes talking one-on-one with an athlete allows me to get an update on how their training is going and observe their progress, motivation and fatigue. 4. Time Efficiency: Most of us waste quite a bit of time every time we ride outdoors. First of all, there is the planning. We have to look at the weather, decide what to wear, plan the route and the best time to go. We have to put on all those clothes (which can take quite a while in the winter), make sure our bike is ready to go, and finally, head out. If we are riding with other people, there is also the inevitable waiting around time. If we are doing intervals, we have to ride or drive to a specific location, which is often further away than we really need for a warm up and further back home than we need for a cool down. And then there are the red lights, the stop signs, the traffic and the occasional flat tire. When we ride indoors, we can schedule the workout for whenever it is most convenient (regardless of traffic, weather or daylight), we can get exactly the warmup we need, start the intervals exactly on time and cool down without having to weave through traffic or climb a big hill. Most of us are much less likely to waste time indoors. If we're outdoors, enjoying the nice weather or on a group ride chatting with our friends, chances are that a significant portion of the ride will be "junk miles". That's not to say that the extra time is necessarily hurting us, just that it's probably not helping us, at least from a training perspective. So, with so many great reasons to do indoor workouts, why do most people still dread them? In my experience, it comes down to either a) equipment, b) boredom or c) discipline. In part 2 of this article, I will address the equipment necessary (or useful) for indoor workouts, how to reduce boredom and finally, "tricks" that can be used to stay disciplined.